For the past few years, I’ve planned, led or attended a holiday lights run in DC. And each year it’s gotten better and better (and bigger). I’ve learned a couple of things along the way. Read on for a few tips if you’d like to organize an awesome holiday lights run for your friends while the lights are still shining bright. Scope out your route in advance. This sounds obvious, but it deserves mention. When you plan your route, pay attention to things like traffic flow and any safety concerns. You’ll be running at night – try to avoid uneven streets or things that could trip people up. Plan start time accordingly. Some trees are lit at particular times each evening. You want to make sure each tree and light display that you’ll visit will be all pretty for your group! Invite everyone! This kind of run is perfect for all paces because you are running from destination to destination. Not to mention there are plenty of sanctioned stops to take pictures! We always have a wide variety of paces and everyone just runs at an easy pace, talking the whole time. This is a great run to invite someone who is intimidated by group running to because it’s all about the fun! Fun accessories are never wrong. If you can encourage your group to don their ugly Christmas sweatshirts or antlers, it just adds to the fun! Also – encourage folks to wear reflective items. This can make a big difference while running! End with warm drinks. This is something that I learned my first year planning a holiday lights run. The run ended run outside – it was awkward and not conducive to people continuing to hang out if they so chose. Ever since then, we’ve ended indoors at a nice hotel with a lovely holiday display. We grab drinks, take more pictures and chat. It’s the perfect way to end the evening. Holiday light runs are so fun and a great way to combine the spirit of this time of year and running. I absolutely love these runs. 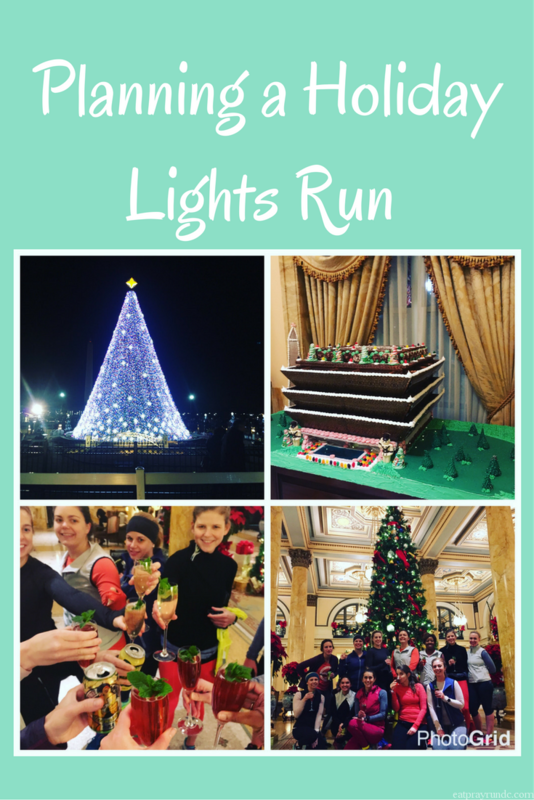 I hope some of you are inspired to go do your own holiday lights fun run! Do you do a holiday lights run? If so, what are your tips to add? What a great idea! I love looking at all the lights this time of year. It’s one of my favorite runs of the year! I’ve never done anything like this! It looks like such a nice idea… we have Christmas lights in London of course but not to the same extent as you guys seem to have in the states! It’s super fun – try it! Bill and I had been going out for a nighttime run to enjoy the Christmas lights at least once each holiday season for years, but two years ago I planned my first official group holiday lights run. Last year I joined in on one, but had to skip this year’s because I’d had surgery to remove my melanoma that morning and couldn’t run for a week. I would love to run through DC at night to enjoy the lights in the city! I hope your Christmas was wonderful and you’re having time to relax as we await 2017!